The legendary tenor has inspired the Montblanc Patron of Art Luciano Pavarotti Limited Edition. The pens beautifully depict the iconic opera singer’s lucky charm, his favourite outfit and many other details of his career and personality. Italian tenor Luciano Pavarotti was opera’s first global superstar. He enthralled audiences with his extraordinary performances and vocal tone for nearly half a century. His legendary performance of the aria “Nessun dorma” from Puccini’s opera “Turandot” made opera accessible to broader audiences. Pavarotti’s humanitarian efforts included bringing together the world’s best musicians, across all genres, for his ‘Pavarotti & Friends’ concerts that raised millions of dollars for vocational and educational projects. A genuine patron of the arts, Pavarotti also nurtured young up-and-coming singers and offered them free private singing lessons. 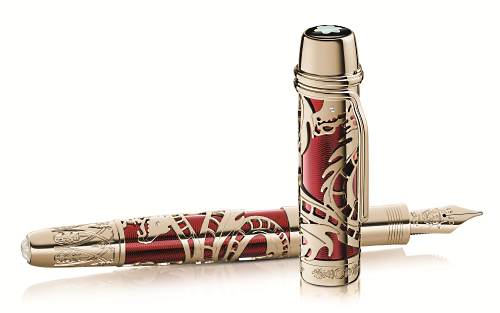 He was also famous for his unique extravagances, which have now been captured in the design of the Montblanc Patron of Art Luciano Pavarotti Limited Edition, a writing tribute to the great opera icon. Every detail of this Limited Edition created by Montblanc’s master craftsmen, celebrates his colourful personality and commitment to arts and culture. 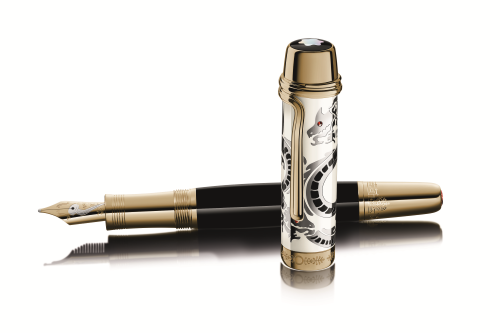 The Limited Edition 4810 depicts the black tuxedo Pavarotti wore with a white shirt and a white bow tie to most of his concerts; the pen’s barrel is black lacquered and the cap is white lacquered. His love for Hawaiian shirts inspired the delicate red lacquer floral pattern at the cone and the turquoise resin cabochon at its base. The writing instrument’s gold-plated clip is in the shape of another trademark item from Pavarotti’s wardrobe: one of his favourite extravagant scarves elegantly wrapped around the cap. Interestingly, Pavarotti never went on stage without his lucky charm: a bent nail. And so the 18 carat solid gold nib of the writing instrument is embellished with a bent nail. The Montblanc emblem, crafted from precious black and white resin, sits on the crown of the pen. Puccini’s opera “Turandot” and the aria “Nessun dorma” catapulted him to global fame and remained his signature performance throughout his illustrious career. 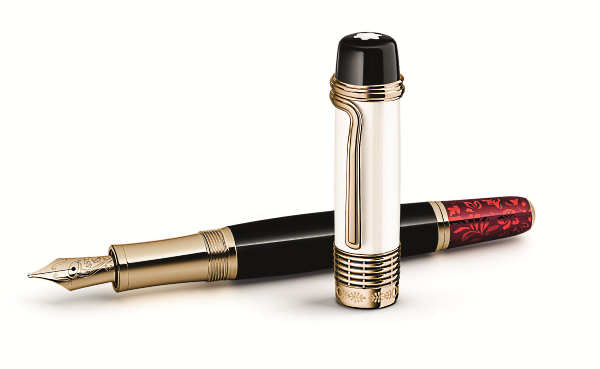 Because the opera is set in China, the influence of the Far East is reflected in the Montblanc Patron of Art Luciano Pavarotti Limited Edition 888. It features an elaborate black and white lacquer dragon with gleaming red garnet eyes adorning the cap. The cone in 18 carat gold has intricate engravings of an oriental opera motif, and its base is adorned with a beautiful facetted garnet. Once again, the bent nail Pavarotti carried with him everywhere features as a subtle engraving on the 18 carat solid gold nib with Pavarotti’s trademark scarf draped around the cap. The Montblanc emblem is in precious mother-of-pearl. In 1998 Luciano Pavarotti was presented with the Grammy Legend Award. Commemorating that moment, this pen is limited to just 98 pieces worldwide. Its overall design is based on the tenor’s memorable performances of Puccini’s “Turandot” and its tragic score based on the cultural heritage of China. Entwined around the cap and barrel is the mythical Chinese dragon, made from masterfully skeletonised 750 carat gold. Depicting the flower that inspired Princess Turandot’s musical motif throughout the opera score, a jasmine flower in white jade adorns the 18 carat solid gold cone. Teatro Comunale in Modena has a velvet curtain named after Pavarotti. It is symbolised by the red lacquer of cap and barrel, enhanced with delicate guilloche work. 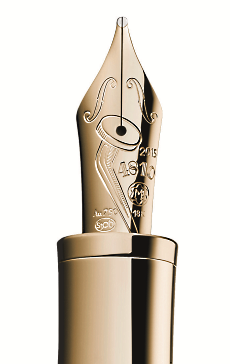 Finally, the very portrait of Pavarotti is engraved on the 18 carat solid gold nib of this Limited Edition. The Montblanc Patron of Art Luciano Pavarotti Limited Edition 4810, 888 and the Luciano Pavarotti Limited Edition 98 is now available in Montblanc boutiques worldwide. Tagged Accessories, Culture, LifeSpice, Luxurious lifestyles, pens, Sartorial Notes. Bookmark the permalink.